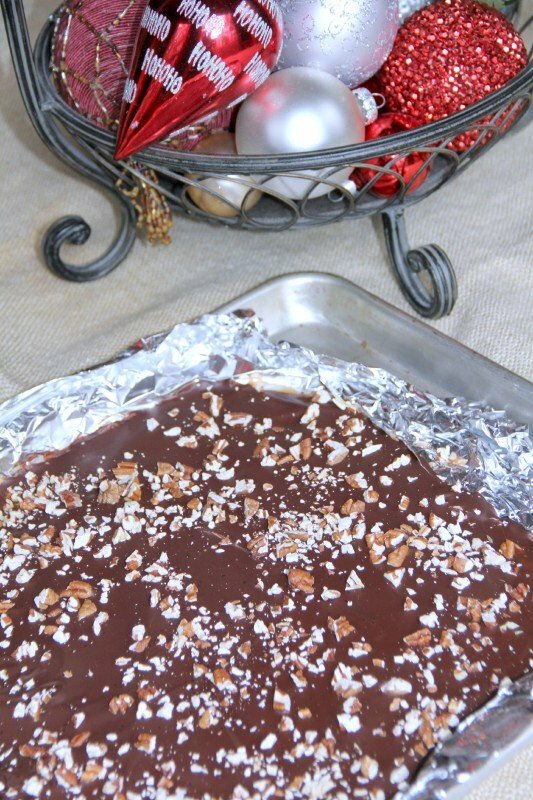 This easy Butter Toffee recipe is better than store bought and makes a great holiday food gift! Thank you. That comes from the bottom of my heart, from the tips of my toes, from the places deep down inside that nobody ever sees or talks to but my imaginary friend. Each time I delve into the dashboard of In a Southern Kitchen and read a comment, or a friend texts me and says, “I made your so-and-so…,” or someone likes my Facebook page, I marvel at both the wonder of technology that allows me to send my recipes into your world, and also the intimacy that said technology can create in one tiny corner of the universe. Each time I write a recipe for cake or snap a photo of soup or share something on social media, that part of me that will always be a pimply, insecure teenage girl of 13 wonders if anyone is out there, if anyone cares, if anyone ever reads my writing or cooks the recipes. And without fail, each time there is validation that someone in fact, does. Thanks, hubby and Mama. And the rest of you. So. Very. Much. And so I leave you with this, my favorite food gift recipe of all time. 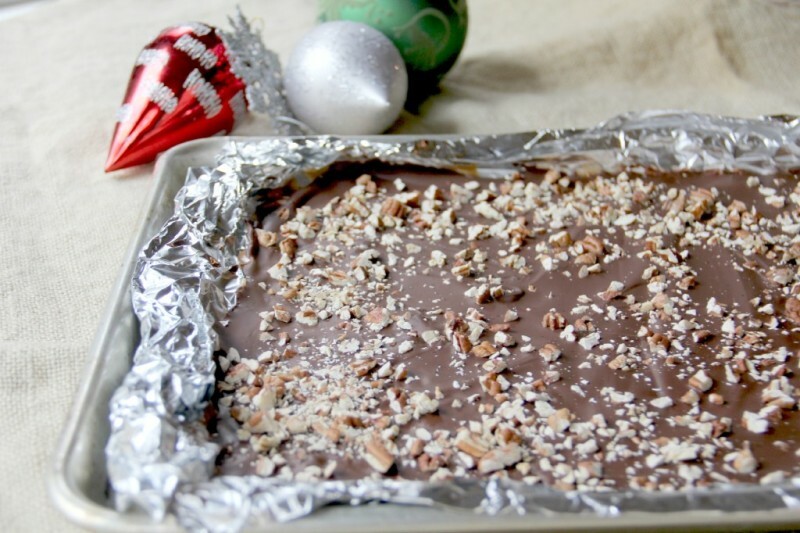 I wish I could make some of this lovely and easy butter toffee and send it to you. But we will have to settle for me sharing the recipe and you making it yourself, sharing it with those you love. I’ll meet you back here around the first of January. Meanwhile, I’m going to cook for my family, win a gingerbread house competition (ha! ), drink wine with my girlfriends, eagerly anticipate the arrival of my first grandchild who will be here in just a few weeks, and relish in the joy that is to be found in this most miraculous time of the year. I hope you do the same. Note: you need a candy thermometer for this recipe and good oven mitts as the mixture can sputter out on you. I do not recommend this as a recipe for children to make. Preheat oven to 350. Toast the pecans on a baking sheet in oven for 7-8 minutes until fragrant and lightly browned. 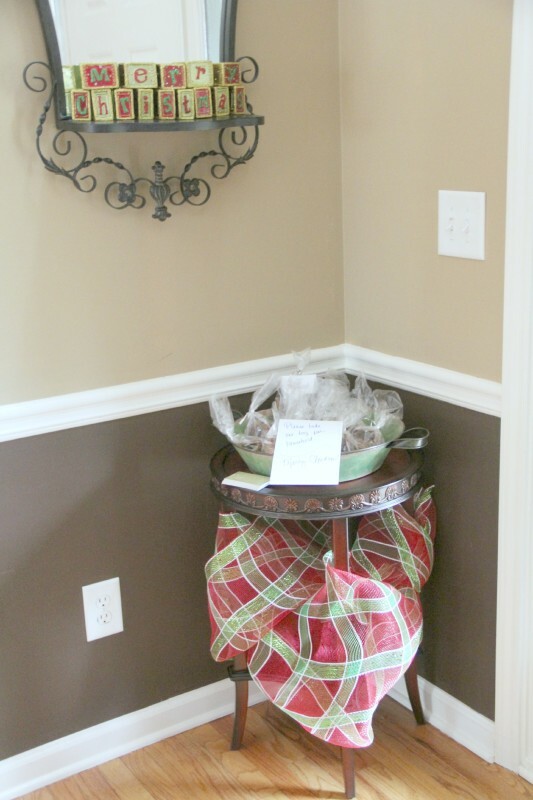 Using heavy duty aluminum foil, create a 10-inch square shell with 1-inch high sides. Place foil shell on a baking sheet. In a large, heavy-bottomed saucepan, cook butter, sugar, salt, and water on medium heat until the temperature reaches 305F (hard-crack stage), stirring occasionally. 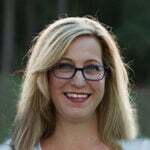 The temperature will increase rapidly once it hits about 280). When the mixture is dark golden brown and 305, immediately remove the pan from heat. Carefully stir in the vanilla (it will sputter so wear an oven mitt) and mix well. Pour the hot mixture into the foil shell and use an offset spatula or a large spatula to spread but don't try to get it all the way to the edge or it will be too thin. You will need to do this immediately because the toffee starts to set as soon as you pour it out. Cool at room temperature for 45 minutes or until hard. Meanwhile, melt the chocolate according to package directions, usually 1-2 minutes in a microwave-safe bowl. 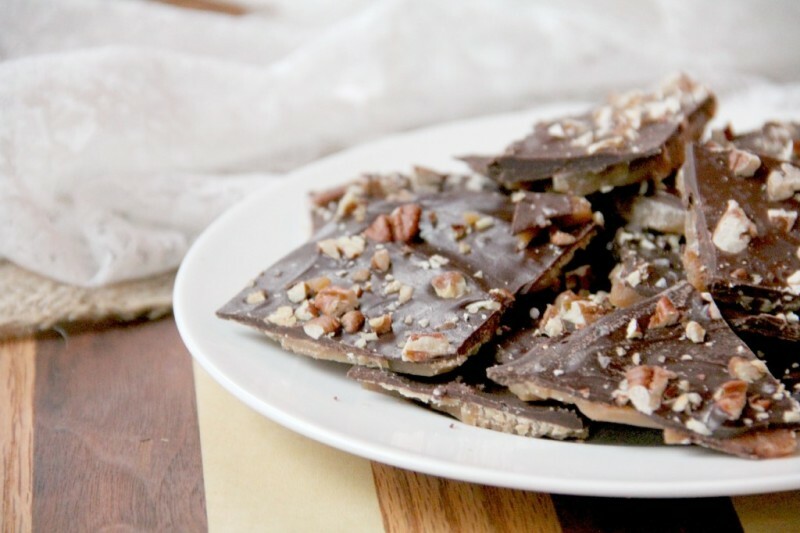 Spread the melted chocolate over the cooled toffee and sprinkle with the pecans, pressing lightly to set the pecans. 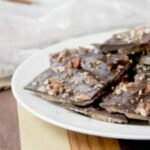 You can omit the pecans and sprinkle instead with coarse sea salt. I usually do a batch of both. Allow to set at room temperature at least 1 hour or until the chocolate is set. 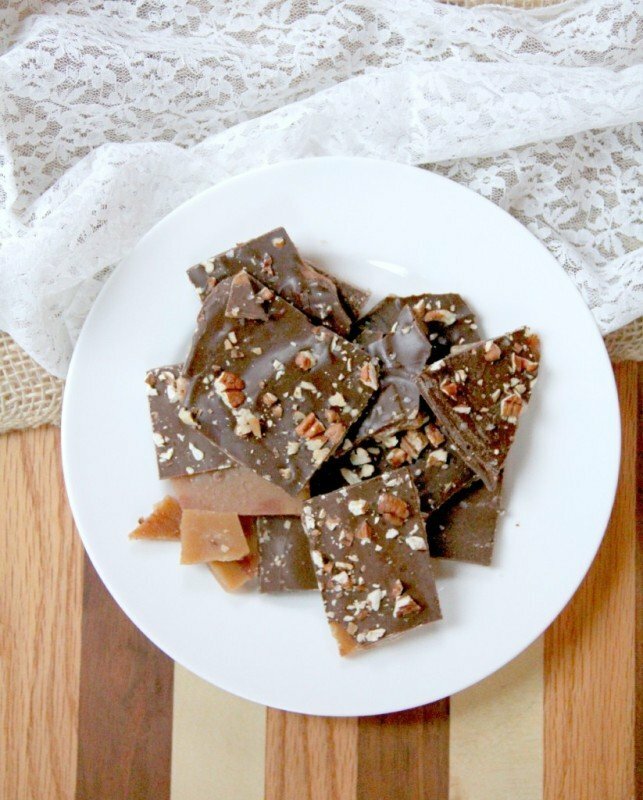 Break toffee into pieces. Store covered at room temperature for up to 1 month.